I saw an old, asian man rummaging through a bin in Ilford today as my Dad and I had just come out from a restaurant. And although this may not seem that unusual, it really made me think. About what exactly? Well, first, the two extremes in our society. On the one end, we have those who live lavish lifestyles and waste despicably vast amounts of money and then, on the other hand, there are those who live in the depths of poverty. The two extremes seem irreconcilable to the human mind when deliberated over. One person starves to death because they have no food, and the other has so much food that they die from obesity. It’s actually quite ironic. My Dad and I left the restaurant, leaving a pretty miserly 60pence tip, taking the £2 change the waiter had given us. Usually – or should I say – every single time I have ever been to a restaurant with my family – we leave a minimum £2 tip. This time, however, my dad decided to take the £2 change and put it in his pocket. Upon seeing the man rummaging through the bin, my dad, without much thought, gave the man the £2. It was as if the £2 was meant for him. What’s pretty disheartening, is the fact that an old member of society – especially an asian society who are suppose to be very family orientated – has been left without any help, food or support. Where on earth are his family? If he was slightly mentally ill, which I suspect he was, why hasn’t he been put into care? In one of the most prosperous nations on earth, with one of the largest economies, we still have people going through bins to eat. It’s crazy. When giving the man the £2, he seemed a bit threatened, it was as if he thought we were going to reprimand him, but once he saw the money he was profusely grateful. We don’t know how lucky we are. 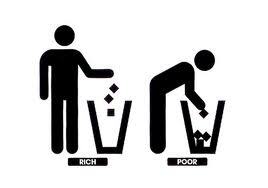 We’re often discontent with what we have. But why? We have everything we need. Appreciate it.